When James first started school, his sister practically had to drag him there. The classroom was dark and dreary, and James knew everything outside was more exciting than anything he'd find inside. "We make our own light here," Reverend Meachum told James. And through hard work and learning, they did, until their school was shut down by a new law forbidding African American education in Missouri. Determined to continue teaching his students, Reverend John Berry Meachum decided to build a new school-a floating school in the Mississippi River, just outside the boundary of the unjust law. 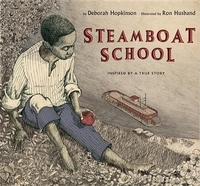 Based on true events, Ron Husband's uplifting illustrations bring to life Deborah Hopkinson's tale of a resourceful, determined teacher; his bright, inquisitive students; and their refusal to accept discrimination based on the color of their skin.